Were it not for Leicester City, the Western Bulldogs would have an easy claim to the most heartwarming underdog story of 2016. Behind standout performances from Tom Boyd and Norm Smith Medal-winner Jason Johannisen, Western completed their unlikely title run in the Australian Football League Friday, offing the powerhouse Sydney Swans 89-67. The Bulldogs’s Grand Finals victory—against a team making its third Grand Finals appearance in five years—marked their first title game appearance sine 1961 and first premiership since 1954, ending the longest current title drought in the AFL. 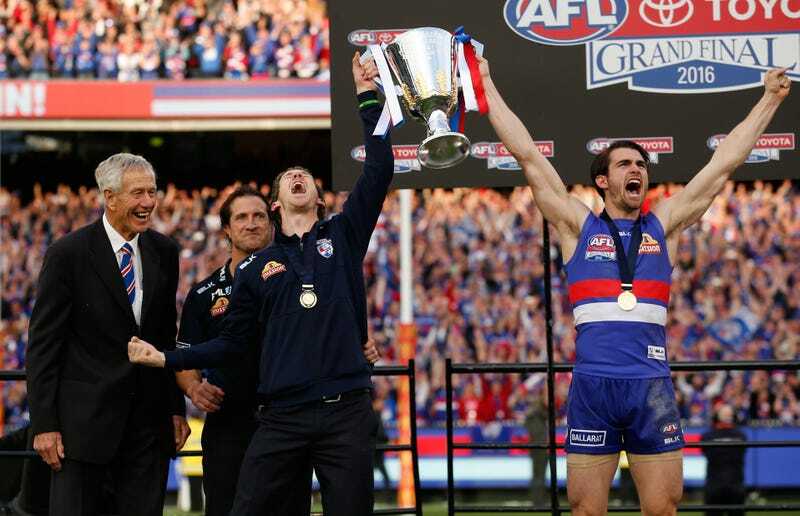 The Bulldogs, lacking a second of Grand Finals experience on their roster, managed to become the first team to finish seventh in the AFL ladder and go on to capture the league title; they did so against the No. 1 team in the league, no less. And the squad managed all this without their captain, Bob Murphy, who has been nursing a knee injury on the sidelines for the last 24 matches. Murphy is a nothing short of a legend for the club. After being drafted by the team in 1999, he’s been with Western for the past 16 seasons, growing into one of the team’s most versatile and coveted talents, playing both attack and defense. He was named captain in 2015, a year in which the Bulldogs managed to finish sixth in the AFL ladder—a vast improvement on their 13th-place 2014 outing. After attempting to come back for a kick in the final minute of a 93-90 Round 3 loss to Hawthorn, the 34-year old Western captain’s left knee buckled—his ACL, the same one he tore in 10 years ago in 2006, gave out once again. While he was getting up in age, Murphy was still an All-Australian performer in 2015 and was expected the post a similarly successful campaign in 2016. One awkward plant later, many feared Murphy’s career, along with the Bulldogs’ season, were done for. Murphy was lost April 10, in Western’s third game, meaning the Bulldogs would have to compete for a top-eight slot without their best player, a feat considered a pipe dream to those around the AFL. But neither Murphy or Western were so easily discarded. The defender underwent successful knee surgery April 22 and vowed to return for the 2017 season in June. All the while, his squad was quietly hanging around the top half of the board, aiming for a second-straight premiers appearance. Without their skipper, the Bulldogs finished seventh in the AFL ladder—the top eight advance to the AFL’s finals, a four-round, single-elimination tournament capping the 23-week regular season. Like the NFL and NBA playoffs, finishing at the top of the bunch has benefits—if a team is a top-four finisher, they are allowed a second chance should they lose in the first round; if they win in Round 1, they skip Round 2 and advance to the semifinals. Instead of having the luxury of a mulligan or a bye, Western faced the two teams that competed in the 2015 Grand Finals, the West Coast Eagles and Hawthorn Hawks, and the league favorites, Greater Western Sydney Giants; the Bulldogs downed all three en route to setting up a title game clash with Sydney, which topped the AFL with a 17-5 record and romped in its prior two tournament matches by an average 36.5 points. The Swans made a game of it through three quarters, entering the final period down 61-53. Twice, Sydney closed the Western lead to one, but thanks to a breakout performance from Boyd, the Bulldogs put the Swans away with three consecutive kicks in the fourth quarter. While Johannisen snagged man of the match honors, the 21-year old Boyd played the role of in-game hero, sealing the Bulldogs’s drought-breaking win with a booming, bouncing kick from 55 meters out with 5:15 remaining, putting Western up 15 and bringing the cup back to Melbourne for the first time 62 years. During an emotional medal ceremony following the win, Western head coach Luke Beveridge closed his time at the podium by calling Murphy up on stage and presenting him with his premiership medal and allowing Murphy to hoist the premiership cup along with captain Easton Wood. Unlike most North American sports leagues, the AFL reserves championship medals to those who actively participate in the title game. In similar fashion, the coach and team captain are normally the two that take part in the hoisting of the cup. Murphy gets a medal, the Bulldogs get the premiership, and Beveridge gets a gold star for being a swell coach.